Launching soon on the Game321.com games portal, Age of Civilization sends players back to the European Middle Ages – with a fantasy twist. The games events and quests are based on both history and myth, creating a thrilling storyline of heroism and fantasy as players develop their kingdoms, raise their armies, and use their strongholds to protect the continent from evil forces. 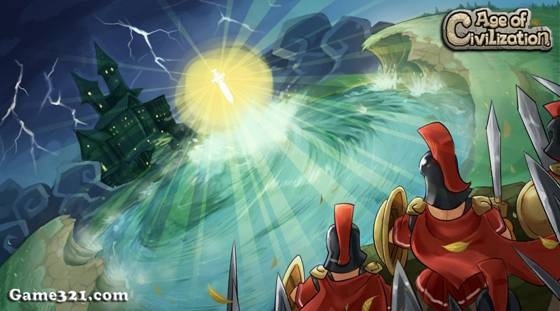 The MMO boasts 3D rendered visuals, advanced strategy-based battle systems and a stunning array of options for players to develop castles into powerful and unique strongholds. Following the successful rounds of testing earlier this year, the Age of Civilization Closed Beta is coming back for a third round on the Game321.com portal! And this time data will not be wiped, so players can use their accounts even after the testing. Selected players will soon be invited to test a range of new features ahead of the upcoming open beta release, such as all-new options to develop cities into kingdom of immense power and wealth. The mysterious tavern, where battle-hardened warriors meet between missions, will be packed with all-new heroes to recruit. Every hero is unique in Age of Civilization, adding new layers to a King’s battle strategy. Recruit wisely and victory is yours. The plethora of skills that heroes possessed in the previous closed beta have now being bolstered by the addition of special passive skills, adding more firepower to their arsenal and making each hero even more unique. With so much choice, you’re guaranteed to find a suitable hero for any team in the tavern – just make sure you buy them a drink first! Battles can happen anywhere and at any time in AoC, so recruit wisely. Age of Civilization players must continually practice and perfect their combat abilities if they wish to survive the deadly lands, defeat the dark forces, and protect their people while reuniting the broken continent. Following player feedback, the games battle system has been revamped to offer a more fluid experience. Better yet, players can now take their heroes into 1v1 or 2v2 battles, where they must combine brain and brawn to defeat their enemies. Who will be the perfect team mate for your squad of heroes?